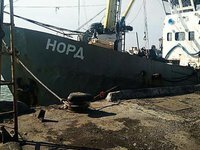 The Russian fishing vessel Nord detained by Ukraine has been handed to the Ukrainian National Agency for Tracing, Recovery and Management of Crime Assets as material evidence in a criminal case, the prosecutor's office of the so-called Autonomous Republic of Crimea based in Kyiv has reported. This transfer was accomplished in line with a ruling by the Kherson City Court, the office said. The Russian vessel should be put up for auction. "The goal of the vessel's transfer is to carry out all management procedures to preserve and increase the value of assets or transfer the management of assets based on a management or disposal contract, or to sell the relevant assets and then deposit the cash into accounts with state banks until the completion of the criminal proceedings," Yevhen Komarovsky, a senior official at the prosecutor's office of the so-called Autonomous Republic of Crimea, said. The decision was made to save budget funds for keeping the detained vessel at Berdiansk seaport, it said. It was reported earlier that the Ukrainian State Border Service detained the Nord with ten crewmembers on board on March 25, 2018. The office of the Verkhovna Rada human rights commissioner said it upheld the ownership rights of the sailors from the Nord, as some of their personal belongings were discovered on board when the vessel was being transferred to the Ukrainian national agency for its subsequent sale through an auction. "Volodymyr Ostapenko, the commissioner's representative for the southern regions, and secretariat employee Viacheslav Bondarenko ensured the observance of the sailors' ownership rights during the vessel's transfer by the prosecutor's office of the Autonomous Republic of Crimea to the agency. They inventoried the sailors' personal belongings and drew up a relevant deed. This deed and a log with records have been passed to the ombudsman's office," the office said in a statement on Friday evening. The office said it was monitoring the observance of the Nord sailors' rights and therefore invited them to be present during the vessel's transfer, but they refused. "The commissioner's office stresses yet again that the rights of the Nord crewmembers have not been violated," it said.